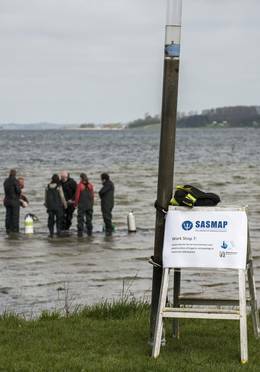 The SASMAP seminar and workshop was held at the Viking Ship Museum on the 22nd and 23rd of April 2015. Have a look at the programme. Participants from the UK, Denmark, Switzerland, Italy, Sweden, Australia, Greece, Poland, Germany and the Netherlands were present in Roskilde for the two days, that started with welcoming speeches from the SASMAP coordinator, David Gregory, National Museum of Denmark, Jørgen Dencker, Head of Maritime Archaeology at the Viking Ship Museum, Jesper Stub Johnsen, Head of Conservation & Natural Sciences at The National Museum of Denmark and Karen Edelvang, Head of Marine Geology and Glaciology, Geological Survey of Denmark and Greenland, GEUS. Jørgen Dencker, Head of Maritime Archaeology at the Viking Ship Museum is welcoming the participants at the SASMAP seminar. 53 Participants from 10 different countries were present at the two day seminar and workshop at the Viking Ship Museum in Roskilde. The overarching downscaling and upscaling themes of the SASMAP project and the tools and techniques that have been developed and used within the project were presented at the workshop. 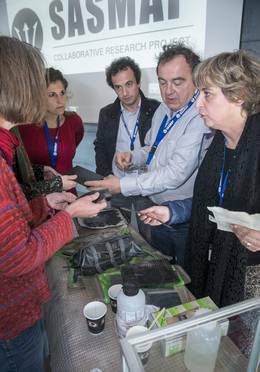 Six different workshops were set up and participants had a chance to speak to the partners, learn and get hands on experience of the different equipment. showing the downscaling elements of the project including the surveying systems and models developed to find prehistoric submerged settlements. Other workshops showed the upscaling elements of the project – how to deal with various elements of assessing, stabilizing and monitoring underwater archaeological sites once they have been localised. 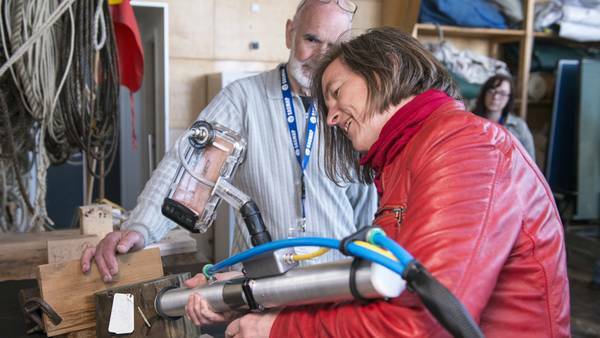 Robert Pedersen and Poul Jensen from AKUT are showing participants the vibracoring device for taking out sediment samples from the seabed. Cores up to two metres were successfully taken during the project. 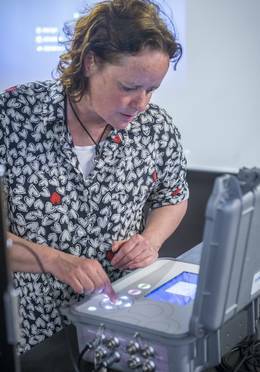 Participants got a chance to try and learn about the different equipment developed within the SASMAP project at the Workshop. 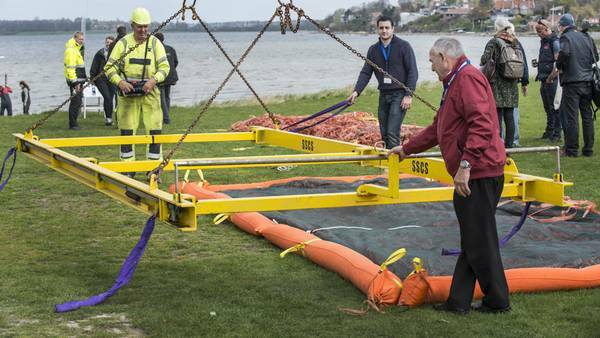 Partners from Seabed Scour Control Systems and the Dutch Cultural Agency, RCE, showed how to operate and use an artificial sea grass mat. 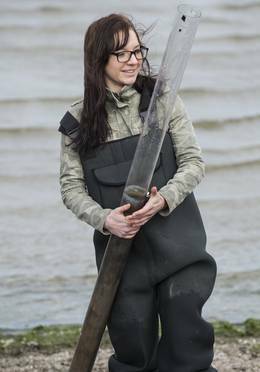 Kirsten Habicht, Unisense, is showing the field sensor equipment for collecting environmental data of the sea bed. Partners from Istituto Superiore per la Conservazione, Ministero dei beni e delle attivita culturali e del turismo, ISCR demonstrating the newly developed material and technique to raise fragile waterlogged archaeological artefacts from the sea bed. Robert Pedersen, AKUT, is showing a participant how to use the wood profiler, WP4UW, to assess the state of preservation of waterlogged archaeological wood. All photos on this page belongs to Werner Karrasch, The Viking Ship Museum in Roskilde.